Let’s back-track a bit…I arrived in Ottawa on Friday and spent the afternoon picking up some last minute things to add to my luggage. Saturday morning I got up bright and early for my 7:15am shuttle to the airport. All my luggage packed and ready to go! (that’s 3 pieces of checked luggage at around 70lbs each…and 2 carry ons + my purse). Every time I fly home I vow the next time I’ll have less luggage…but that is forgotten until I’m lugging the bags around. It was a gorgeous day in Ottawa…it was suppose to get up to 14C at some point on the weekend…but I knew the temps would be much colder when I got home! The first hic-up in the plan was we had a delay leaving Ottawa. One of the flight attendants was sick, so they had to get a replacement from the hotel to the airport! That took just over an hour…but I was starting to wonder if I’d make my 2pm connection to Pang. But didn’t stress too much…what will happen will happen. 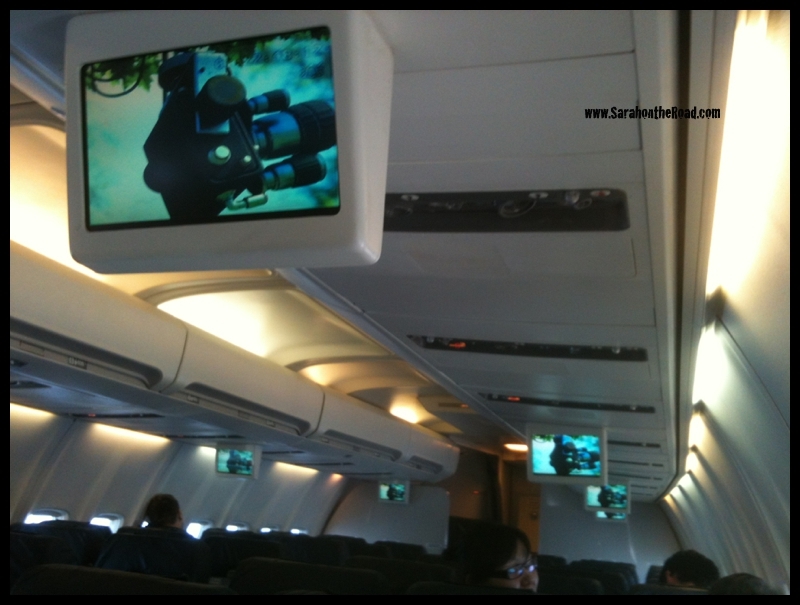 I was excited when I got on the plane..it wasn’t a normal plane used for the Ottawa to Iqaluit route… it had and inflight entertainment system! So nice to watch a movie…ended up watching Epic… it was a really cute cartoon! 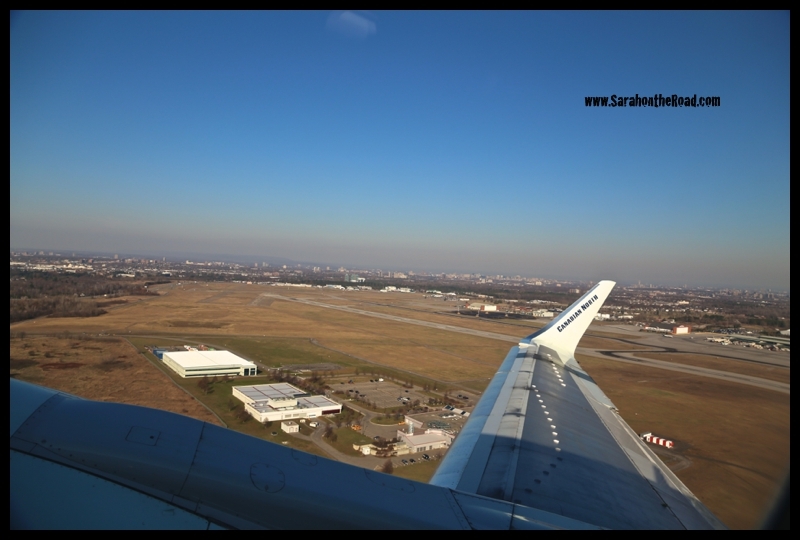 I spent some time using my new camera to grab some shots out the window…goodbye Ottawa. Looking out at snowy tundra makes me so happy- because it’s just so gorgeous! As we landed the sun was just starting to set…it was about 1:30pm! I arrived in time for my flight to Pang…but my bags didn’t make the flight…so they were going to spend the night in Iqaluit and follow me the next day! The day was looking up… I was a wee bit bummed out because I was going to have lunch with good friends in Iqaluit but that was cancelled because of my delay! So the weather was iffy in Pang…we were green carded at the gate…so that meant if we ended up back in Iqaluit the airline wouldn’t be responsible for meals & hotels. 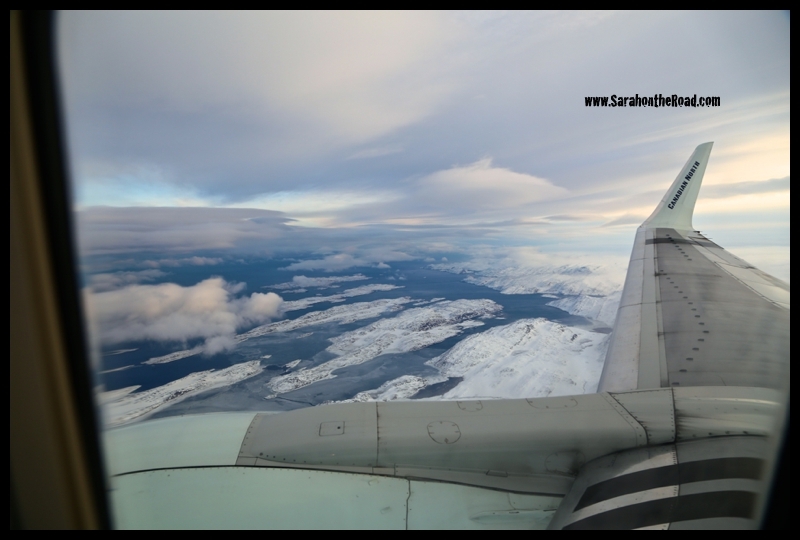 We ended up circling at the mouth of the fjord for about 20minutes but the ceiling wasn’t high enough…so we turned around and flew back to Iqaluit. That’s what I call a 2 hour fly-by! When I arrived back in Iqaluit I called my friends and ended up going to their house for the evening. It was great to catch up…and spend some time with them. I was rebooked with a different airline that flew on Sunday (since my original carrier didn’t fly to Pang on Sunday!) Remember all those bags? and how heavy they were…they came too and from the airport….when I checked back in on Sunday, only to find out that the weather was still bad in Pang and the flight was cancelled. I was rebooked on the Monday evening flight! 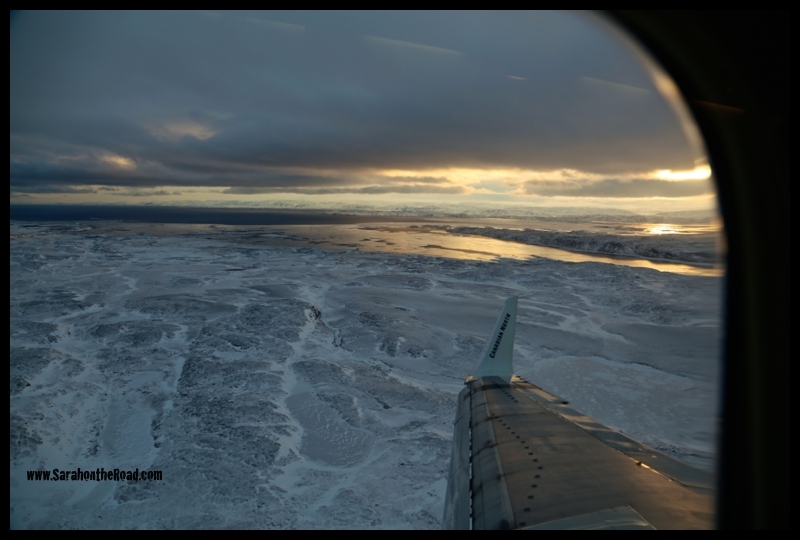 After a day spent in our Iqaluit office… I headed back to the airport for the third time. Hoping I would get out of Iqaluit before the blizzard that was suppose to happen in the next 24 hours. 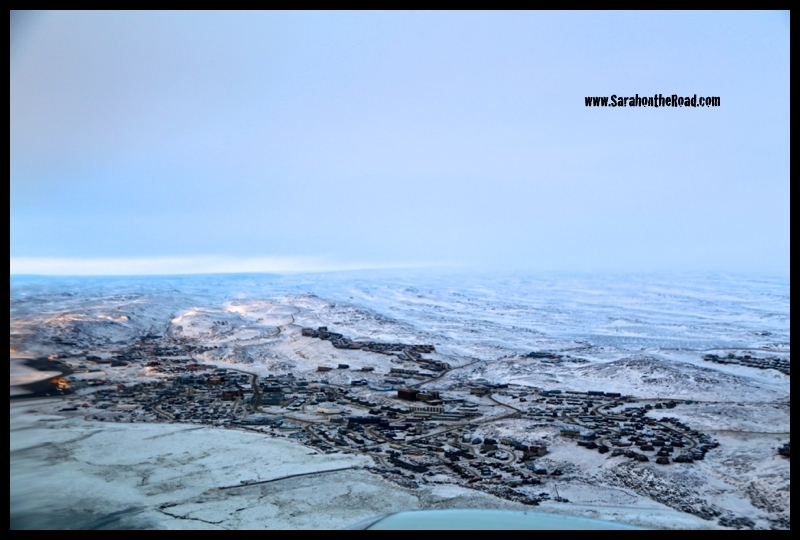 I managed to fly out in the right window–able to leave Iqaluit but then also land in Pang! I was lucky and ended up home…and even a lucky bonus the contents of my cooler were still cold (but not 100% frozen yet…). When you travel anywhere you should always be prepared for delays…and have patience! And one friend in Iqaluit says I have the worst travelling ju-ju ever…and she says she doesn’t want to fly with me! This entry was posted in Life in Nunavut, Travel in Canada, Visits to Ontario, Weather Woes on November 19, 2013 by Sarah on the Road. I am telling you that you have more adventure than any else I know! Never fly with me…because if you do you might have delays and re-routing happen!!! But honestly, it’s just part of living in a remote spot in the Arctic! Ok I will just fly to you one day! What a difference in scenery from the window eh? That’s so weird that the sun set at 1:30 PM…. It must get some getting used to i guess. The whole sun setting early and rising late is going to take getting use to again…especially because I’ve jumped back into it! (haven’t been here for the gradual change)…the other change is the sun is no longer rising above the mountains so I won’t be able to physically see the sun until mid-February when it returns! It’s so good to be home…and was nice to have a bit of a ‘break’ to see friends in Iqaluit on the way home! The new camera is awesome… can’t wait to shoot with it more this weekend! It’s been such a busy week trying to get settled back into life and work. ahahahha Dude, you totally have the worst travel ever!! But gorgeous photos. Kara–don’t you know it… thanks, I’m loving my new camera!